Brace yourself. This is some seriously good eating. 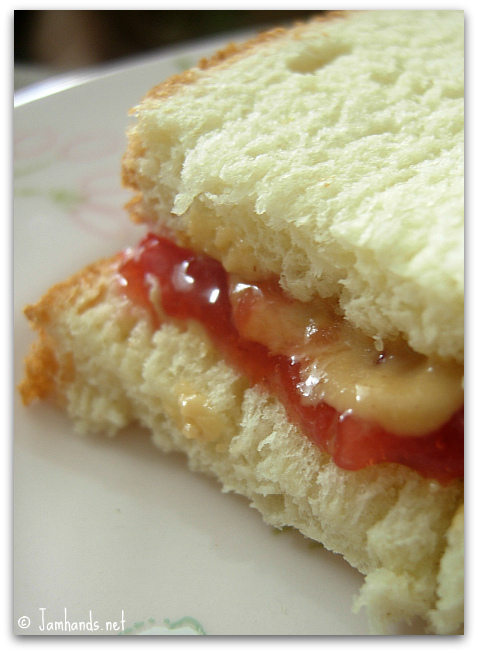 White Chocolate Peanut Butter and homemade Strawberry Freezer Jam. 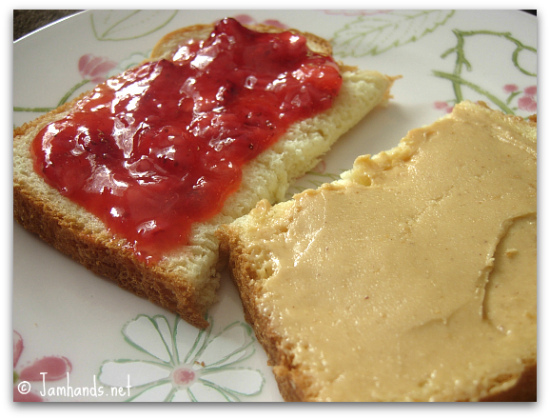 Easily the best PB&J I've ever had, and I'm willing to bet the best you've ever had too. I mean, just look at the deliciousness. Are you ready to make some? Good because it is super simple. 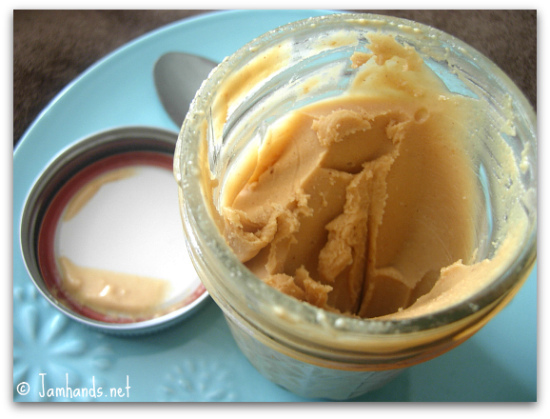 Have you ever tried making homemade peanut butter? What are some creative flavors you would like to add? Note: I am paranoid about storing this at room temperature, so I stick it in the fridge. It will keep for several weeks in the fridge, otherwise if you keep it at room temperature, I would say it will last one week, but you better keep an eye out for anything funky growing. Yuck, see that is why I store mine in the fridge! 1. Add peanuts to a food processor and blend until a thick nut butter forms. Stream in oil and vanilla with the processor on, continuing to run it until the mixture is smooth. You can add more oil if needed, just do it in small increments. Ohhhh my goodness!! This look goooood. I love easy blender type recipes! This looks soo good! Visiting from SITS and I may just try these recipes! I've seen a lot of delicious nut butter recipes lately, but every time I make my own, I can't get past the grinding of the nuts b/c I like it so much plain! I so need to try this, though. Sounds divine! The problem is, I don't think I'd bother with the sandwich. I'd grab a spoon and go to town. As far as the pb staying good, there's nothing in the ingredients that would make it go bad. White chocolate and peanuts are shelf stable, and I know there is a white chocolate peanut butter on store shelves that doesn't require refrigeration. Is it harder to spread out of the fridge? If not, I guess it doesn't matter. Wow. That sounds amazing. I'm going to need to try it! @ Lindsay - I do too! This is a great one, super easy. @ Sweet Little Smoothie - I hope you enjoy it. @ Veronica - The reason I got paranoid was because I read someone's comment on a diff. website on a homemade PB recipe that said they found mold in the jar. This was for a cinn raisin PB. Maybe the raisins were moldy, or the jar? Who knows. It does firm up in the fridge but I just stir it up a bunch and it loosens up a bit. @ Lynda - Thanks! I hope you enjoy it. Awesome. Just awesome. Never made my own peanut butter, but I know it has to be easy because I get the 'grind your own' at Whole Foods. Can't wait to try it!